Western blot analysis of extracts from SNU-475, A172, and SK-MEL-2 cells using PLXND1 Antibody (upper) and β-Actin (D6A8) Rabbit mAb #8457 (lower). 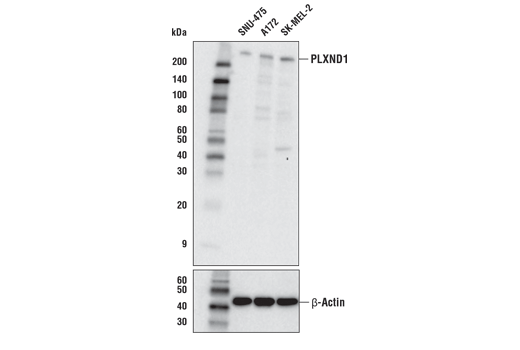 PLXND1 Antibody recognizes endogenous levels of total PLXND1 protein. Polyclonal antibodies are produced by immunizing animals with a synthetic peptide corresponding to residues surrounding Val1665 of human PLXND1 protein. Antibodies are purified by protein A and peptide affinity chromatography. PLXND1 (PlexinD1) is a type I transmembrane receptor for semaphorin (SEMA) family signaling molecules (1). PLXND1 has an extracellular SEMA binding domain, and a cytoplasmic tail containing RasGAP motifs and a RhoGTPase-binding domain. Upon ligand binding, PLXND1 undergoes conformational change and acquires GAP activity that inactivates downstream Rac/Ras signaling, leading to focal adhesion destabilization (2). The PLXND1 signaling pathway plays important roles in neuronal synapse formation, vascular branching, and thymocyte migration (2-4). Increased expression of PLXND1 is positively correlated with tumor stages in multiple cancer types (6). This is supported by gene knockdown experiments that suggest that SEMA/PLXND1 signaling may contribute metastatic progression (7-8). Gu, C. and Giraudo, E. (2013) Exp Cell Res 319, 1306-16. Gay, C.M. et al. (2011) Dev Biol 349, 1-19. Pecho-Vrieseling, E. et al. (2009) Nature 459, 842-6. Zygmunt, T. et al. (2011) Dev Cell 21, 301-14. Choi, Y.I. et al. (2008) Immunity 29, 888-98. Rehman, M. et al. (2016) PLoS One 11, e0164660. Tseng, C.H. et al. (2011) PLoS One 6, e19396. Casazza, A. et al. (2010) J Clin Invest 120, 2684-98.